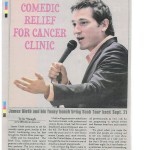 Comedy For The Cure is coming to Louisiana this May! Are you a group engaged in the fight against cancer that is in need of a fundraiser? Get in touch with us to get more details on how you can have your very own night of stand up comedy!